Sometimes, you just read a book because it amuses, without a real sense of why or what is coming. Cryptonomicon, which was not a small diversion at 918 pages in my printing, kept me interested. I can't say I was enthralled or that I couldn't sit it aside, often, without a sense of humor. But it had good humor - in a wry, cutting, judgmental and similar ways, an interspersed historical basis of which I'll assume some is true, and… it’s listed on NPR’s Top 100 Sci-Fi and Fantasy list (#53), which is my reading guidepost currently. While I appreciate the referral, I’d categorize this as general fiction. The general idea is that the Axis powers hid their gold in WWII as a trove for future rebirth of those powers, which time renders a wealth waiting to be rediscovered for greed and personal benefit. To protect it’s location from pesky Western powers, security was tight and encoded from the beginning. So, take that narrative, and intersperse it with a modern one featuring the grandson of one of those originally involved who manages to unravel the mystery in the modern day. It has the requisite quirky and entertaining characters, enough of a linear (but bipolar) narrative to move things along, and ample laughs due to author Neal Stephenson’s creativity, currency, opinions and wit. Oh, and Bobby Shaftoe, rest his soul. Arguing with anonymous strangers on the Internet is a sucker's game because they almost always turn out to be—or to be indistinguishable from—self-righteous sixteen-year-olds possessing infinite amounts of free time. This made him a grad student, and grad students existed not to learn things but to relieve the tenured faculty members of tiresome burdens such as educating people and doing research. Technology is built on science. Science is like the alchemists' uroburos, continually eating its own tail. The process of science doesn't work unless young scientists have the freedom to attack and tear down old dogmas, to engage in an ongoing Titanomachia. Science flourishes where art and free speech flourish. A red dragonfly hovers above a backwater of the stream, its wings moving so fast that the eye sees not wings in movement but a probability distribution of where the wings might be, like electron orbitals: a quantum-mechanical effect that maybe explains why the insect can apparently teleport from one place to another, disappearing from one point and reappearing a couple of meters away, without seeming to pass through the space in between. There sure is a lot of bright stuff in the jungle. Randy figures that, in the natural world, anything that is colored so brightly must be some kind of serious evolutionary badass. It is conventional now to think of clerics simply as presiders over funerals and weddings. Even people who routinely go to church (or synagogue or whatever) sleep through the sermons. That is because the arts of rhetoric and oratory have fallen on hard times, and so the sermons tend not to be very interesting. But there was a time when places like Oxford and Cambridge existed almost solely to train ministers, and their job was not just to preside over weddings and funerals but also to say something thought-provoking to large numbers of people several times a week. They were the retail outlets of the profession of philosophy. There’s much more fun to be had than those thoughtful nuggets would imply, buried gold, as it were, among the crypto technical briefings, bad guys, U-boats, a hilarious Marine, an honorable Nipponese, a very modern (in a sad way) protagonist, and a globe trotting plot. And, I'll say the history was worth something, more than a setting and less than a crutch. Had the author not spent a fair amount of time on the invention of the digital computer and Alan Turing, I may have skipped the stellar movie about him, The Imitation Game, even knowing that the ever excellent Benedict Cumberbatch starred in the lead role. 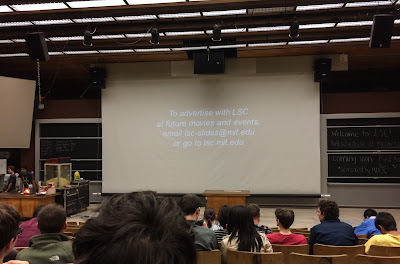 And, strange segue here, if you’re going to watch such a movie, why not with students, faculty and other lofty brains at M.I.T.? 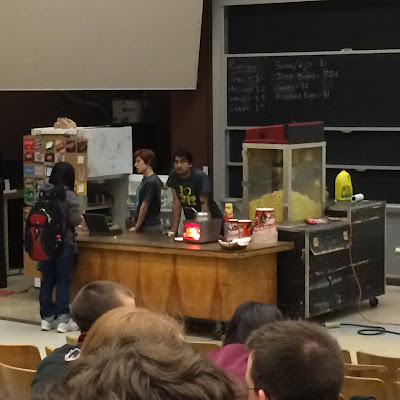 A number certainly have sense enough to enjoy a dollar movie, cheap drinks and popcorn, as college students should. It was a reminder of precious days years ago when myself and a gang of friends used to rule that particular roost… which happened to be a proper movie theater in a smallish YMCA building on campus, that included a marching band practice room, 13 dorm rooms, a chapel and a vacant swimming pool. M.I.T. 's theater doesn't have that refined (*cough cough*) ambiance, but they get by. 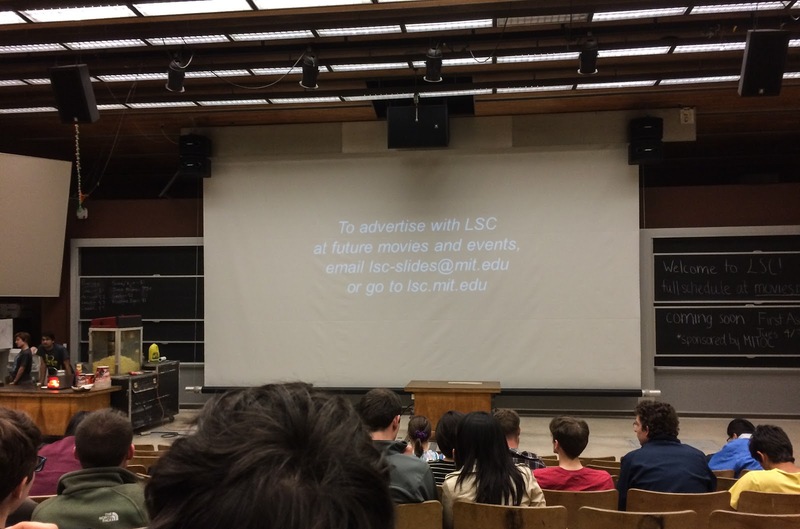 I'm guessing they're all too busy studying to make a real theater worthwhile anyway. Nerds. (Yeah, yeah, I know they legally or illegally stream it to their laptops. Ho. Hum.) Very good book. Better movie. On December 13, 1981, I saw RUSH play at the Roanoke, VA Civic Center. The band was fairly new to me, and my feet were barely wet in arena rock shows. I was standing about 20’ from the stage, and I was fairly blown away by new sounds and the few guys that made them all. 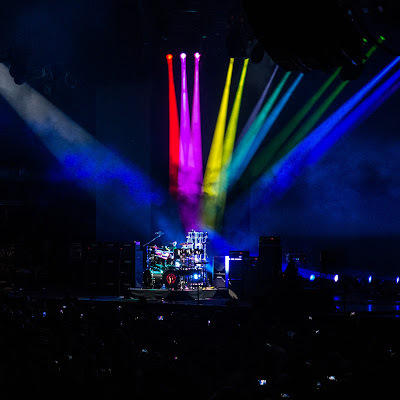 "Exit Stage Left," their live CD they were promoting at the time, remains my favorite Rush recording as it's laden with that memory. Twenty nine years later, I saw them again under a cloud of doubts. 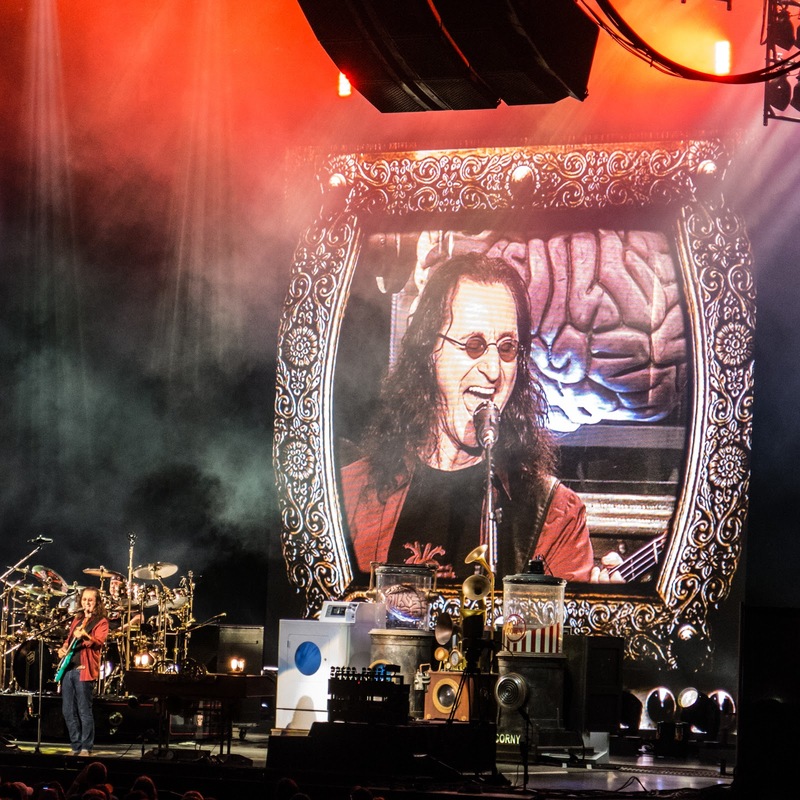 Could Geddy Lee hit the high notes? Sure, they still had all their original members, but would they be any good? Weren’t they just another aging band trying to bank some retirement funds by going through the motions of trotting out old hits for fans who could gift them with their disposable income? As it turned out, no. The band earned their wages plus some. So, here they are, on tour again celebrating, I suppose, their 40th year with yet another tour. And, there’s a capacity crowd of 12,000 returning to hear them again, many sitting on wet grass after a drenching storm. It’s been five years since I saw them last, but (somehow) the crowd changed. 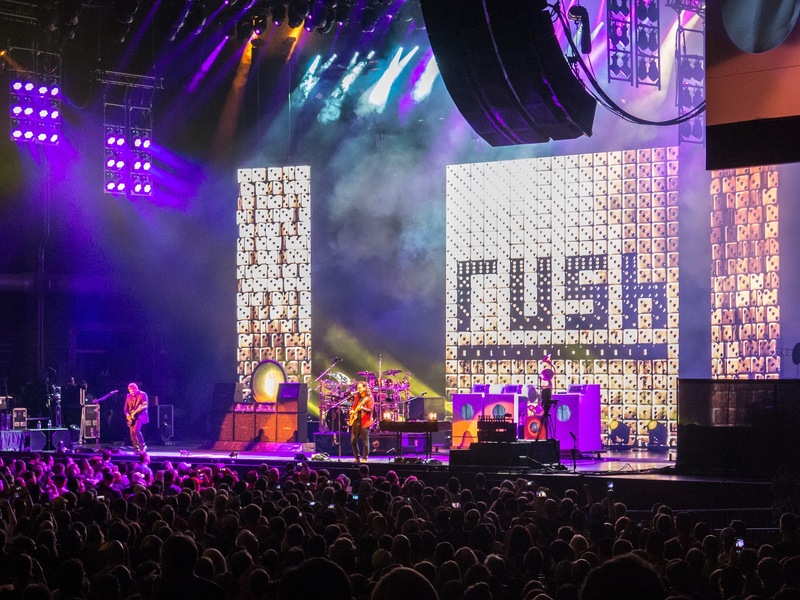 I could have sworn that 99% of the crowd were balding men wearing black RUSH T-shirts from a tour some time prior. The remaining 1% were women, who also wore the same T-shirts. Well, male pattern baldness was in no short supply, but the crowd actually turned colorful in garb, and, GASP!, the female population might have hit 15%! Maybe it’s all the concerts that PBS puts on for fundraisers, but something’s working there. First, I’ll point out that sitting at a reserved table is awesome. 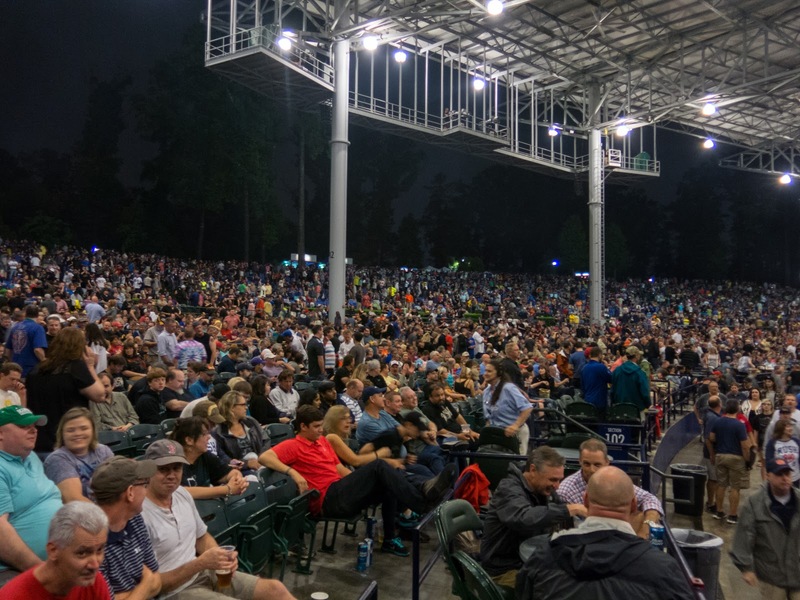 It brings with it VIP parking, space to move around rather than the shoulder-to-shoulder plastic seats, and an elevation advantage over others so that passersby don’t distract (Unless, that is, it’s a woman at a RUSH concert. Their numbers on the increase, they remain a rare species). But, you sacrifice a bit in terms of proximity to the stage. So, here’s my camera’s perspective, which more than slightly exaggerates the distance. This zoom shot feels about right, though. The video boards can certainly project to the folks in the back. But back to those production values. Pyrotechnics (loud), animated video sequences during songs, a massive lighting contraption, minions who wander about the stage adding or subtracting stage fixtures (fake amplifiers, a popcorn machine, washing machines…), professional camera movements to capture the band as they play… it was all very well orchestrated. Oh, yeah. It’s a concert. Maybe I should say something about the music. First, it was loud, louder than I remember. But, it certainly verified an often repeated remark that it’s amazing how much sound three guys can make. I can’t speak for the sound quality overall. Everyone should know that if you’re seated anywhere near the sound mixing board, it should be perfect. But off to the side, everything sounded great except for Lee’s vocals, which despite remaining surprisingly strong and agile, were often unfathomable (for those who don’t have them memorized). And, there was an odd ringing at times that I’d have to attribute to the guitar which made the overall sound undeservedly dense at times. Criticism over! 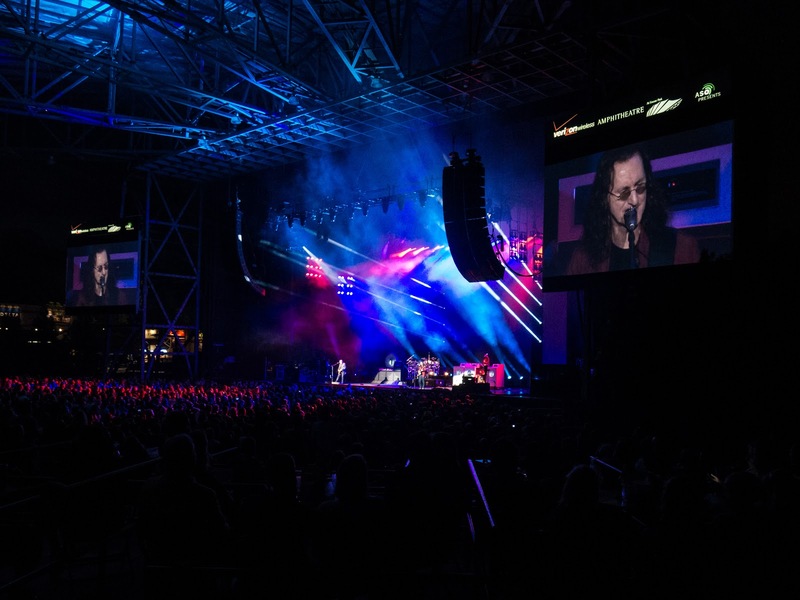 Without a current album to promote, the band retraced their work chronologically, beginning with the most recent, squeezing it into a generous three hour set. 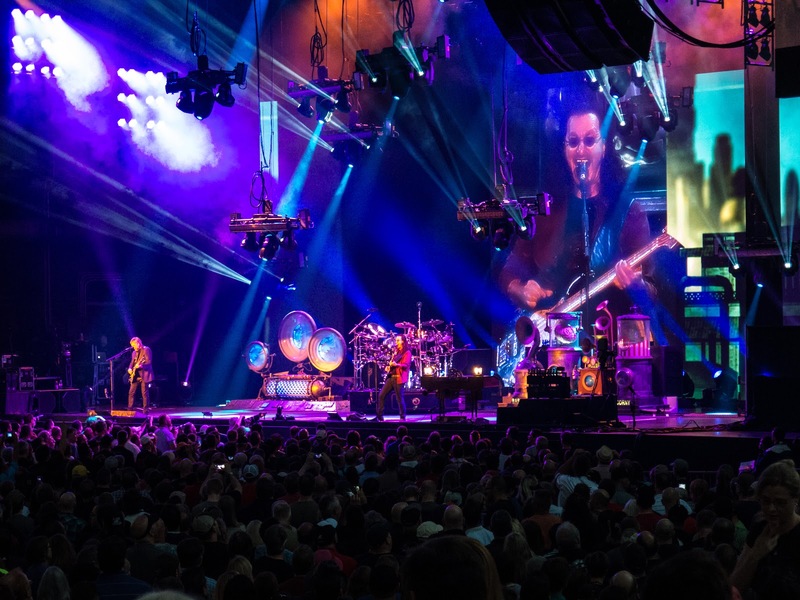 The first three songs were from Clockwork Angels, their most recent, and they more than hold their own with the band’s product the prior 20 years, which suffered from a move towards more contemporary sounds via increased keyboards. But, the songs they selected – like “Roll the Bones,” “Distant Early Warning,” and “Subdivisions” played very well. Following the break, the band returned with songs from their early/classic period, which very much reminded everyone that their best music is born of instrumental virtuosity for all three members, plus challenging arrangements. “Jacob’s Ladder” was my favorite of the evening, but sections of “Cygnus X-1,” “Xanadu,” and the 2112 Overture were a witness to their harder prog rock tendencies (particularly Lee’s very aggressive bass style) that the vast majority of fans likely favor. 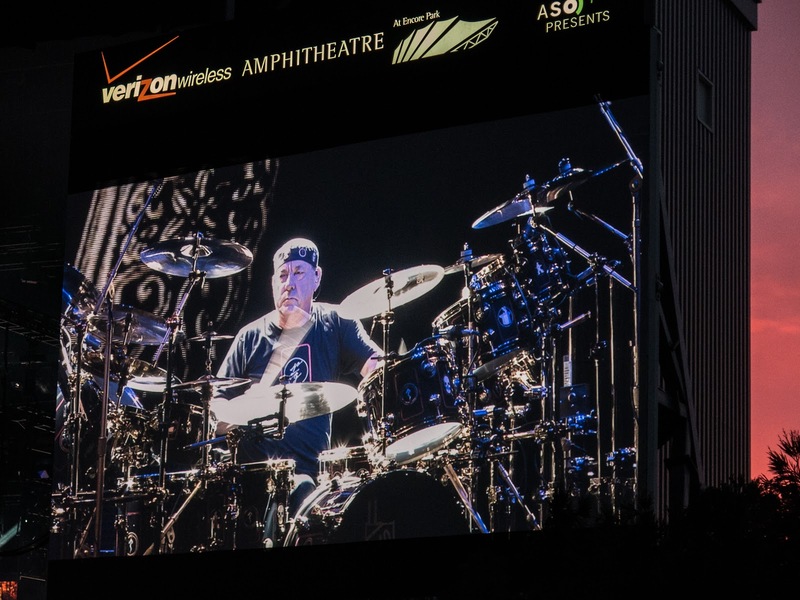 “Cygnus” also provided space for the requisite (never obligatory) Neil Peart drum solo. His kit didn’t include the 360o set that I last saw him with, instead making room for chimes. 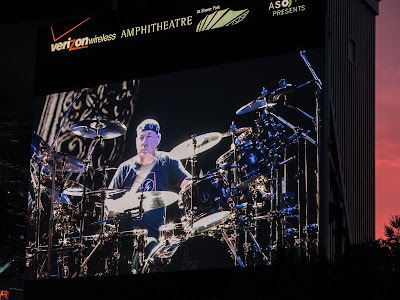 He remains one of the finest rock drummers ever, and, somehow, at age 62, doesn’t break a sweat or, pun intended, miss a beat – of which there were a gazillion. At the last show, Alex Lifeson seemed to clown around a lot, interacting with the crowd in front of him. This time, it seemed the music rarely gave him the chance. 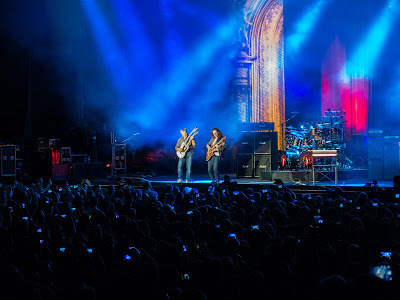 You become aware how many great riffs he’s created over the years, and it’s amazing how a guy with such large fingers can so quickly and cleanly pick his notes up and down the fret board. Otherwise, the R40 tour seemed to be a great excuse for the Lifeson and Lee to empty their equipment closet. They had quite the variety of guitars, including two double necks. 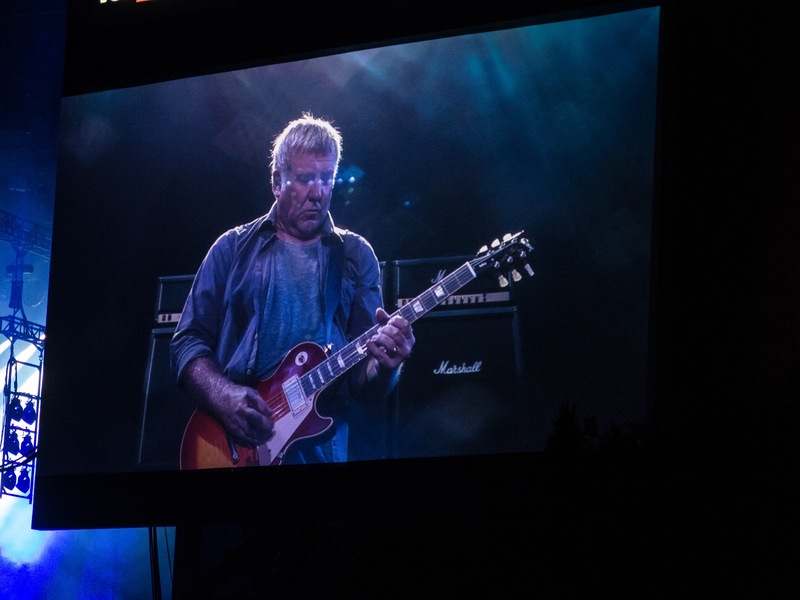 Five years ago, Lifeson may have played four guitars. He probably had ten this time. For the encore, the band finally got to a couple songs off of their first album. 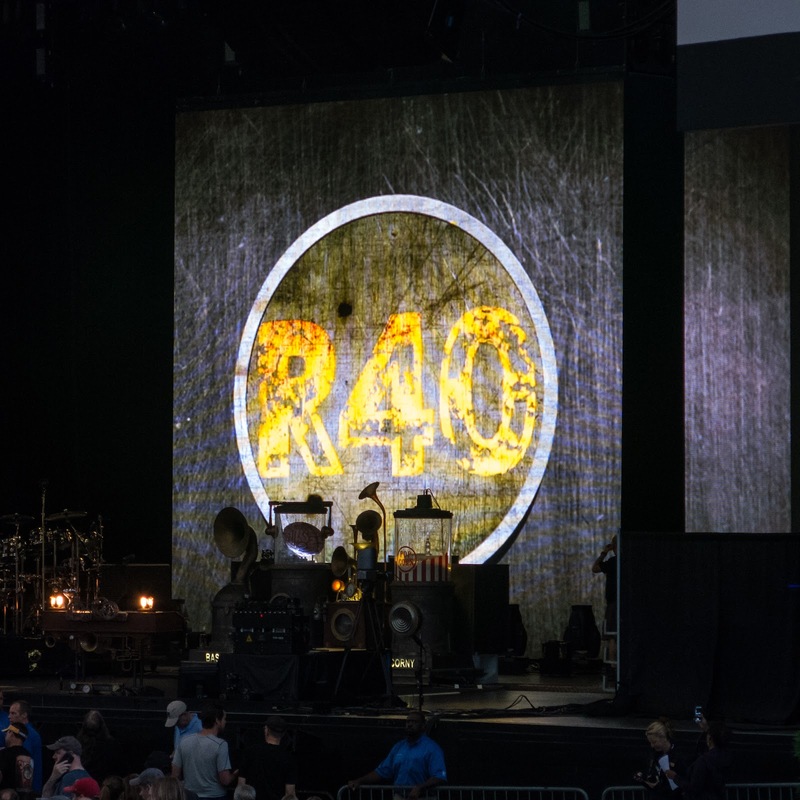 It was fitting for their countdown, but it only demonstrated how far their music grew in the years since. The arrangements were so simplistic that Peart didn’t have to do much except use the bass and snare drums (but, of course, he did). Finally, the show looked like it was fun for the band. Aside from the humor in their videos, it’s easy to see the unforced camaraderie of three guys who have been professionally wed for a long, long time. They seemed to be having fun. 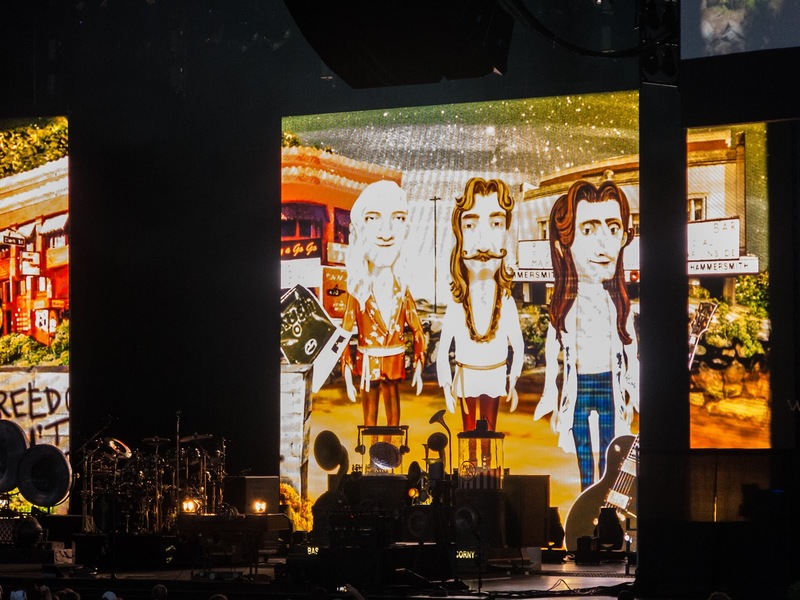 After all, there was no reason for a R40 tour except that they wanted to do it. Not quite a providential view, but… maybe at sunrise or sunset. A couple hundred years ago, I’d imagine people would think just that. Technically the Skywalk Observatory, Boston’s Prudential building has set aside it’s 50th floor for a view of the city. For those interested in some of Boston’s history and notables, there are exhibits to that end. But, it’s the view you’re paying $17 for. And it’s a good one, when skies are clear. Photos… not so exciting. So, I figured I’d torture them a bit. Across the Cambridge River lies M.I.T., with the ugliest dorm in the world at the left edge and their central academic building at the right. Here’s a closeup of the historic academic building. Within, the central corridor running left to right in the picture below is called the “infinite corridor,” measuring almost three football fields long. It connects the east and west portions of the campus. Meanwhile, in the city, Bostonians are kind of packed together. Still, the buildings have their charm, it’s never oppressive, and people are always actively milling around (in good weather, anyway). And, here’s one without the computer alterations… just for a clearer view of what you see. St. Paul, Minnesota is a small city, and very clean with few visible vacancies in its downtown area. It’s the kind of area you might want to walk around, either on the streets or the connecting skyways. But, 0oF temperatures and icy roads are not a motivator, and my travels tend to coincide with just that type of weather. Not this time, though, so it was a great opportunity to visit a new brewery, Tin Whiskers. I’m a sucker for robots. I want to like a brewery with a robot mascot. I admit. And I was afraid that their beer would disappoint. It didn’t. The brewery’s location seems unlikely, but a general trend among craft breweries is that they reclaim old or unusual (cheap) structures for their business ventures. The Rossmor Building is a former shoe factory and now a loft condo. Having a brewery on the ground floor would be pretty convenient for residents. …and there’s a massive robot on the wall. It’s actually viewable from the sidewalk through large pane windows that allow ample light in the building. The space within is open and simplistic. The ubiquitous stainless steel tanks are within view, marginally separated from the tasting area by the bar. And, from the bar, good things flow. This is the Flip Switch IPA. The company names their beers in terms that relate to electrical engineering, as the founders were once Electrical Engineering students, then home brewers, and now business owners. The brewery’s name, Tin Whiskers, refers to tiny hairs that grow from metal surfaces in electrical devices, potentially causing short circuits. Other beers include the Wheatstone Bridge, Short Bridge, Short Circuit and… you get the drift. Below is their current Flip Switch “Infusion,” said to include a light peach flavor. I couldn’t find that, but it was tasty. On another note, their Short Circuit is described as a “sweet stout,” which I liked a lot – it seemed to thin the stout a bit and make it more drinkable. Beer is good. But there has to be more to brewery visit than that, even with a wall sized beer wielding robot. There are a couple of low volume TVs, so if you want to watch selected sports programming, you can. Wednesdays are trivia night, but Thursdays is robot building. Bins of Legos are provided, and there is a contest to build the best robot. The prize? I don’t know. But it seems a very creative way to pump your theme and keep people entertained at a table. So, suggestions for improvement. First, they’re only a year old, but they need more variety. I’m sure they’ll get there in time. Otherwise, the merchandise… you’ve got a killer logo, but… not everyone in the world wants to wear black, and if they do, they don’t necessarily want large capital block lettering on the back. And further, most probably resist paying for any T-shirt that I would call “concert thin,” the cheapest fabric possible. Get some durable cloth. And then, for those preferring grey or red, why is the robot on the side? And the “Tin Whiskers” name plate? Not needed. I opted for the tin wall plate by default (upper left of the photo below), but I was hoping for a decent shirt. (or maybe a hat with a fully centered logo). Someone got overly creative… In any case, I’ll see what’s on draught whenever I’m in town. Good vibe, good beer.